Please note that the American Samoa Conference scheduled for last month had to be postponed due to the critical health situation of the speakers’ wife, Sister Carolyn Sullivan. However, our prayers are never in vain! Thank you for your intercessory prayer for the important events taking place within our Region! Please join us in asking God to anoint our deputation ministry as we seek vital support and laborers. Papeete, the capital of French Polynesia, located on the island of Tahiti, has a population of 131,695 inhabitants in its urban area. It is the primary center of Tahitian and French Polynesian public and private governmental, commercial, industrial and financial services, the hub of French Polynesian tourism. Please join us in prayer for open doors, finances, and workers! "'Shake well before using’. Sometimes that is what God has to do before He can use us." • Rev. Mervyn Miller, former Pacific Regional Director, is recovering after his most recent Mitral Valve heart surgery. Continued prayers are appreciated! *Thank you for your faithful Monthly Reports and Newsletters! A tumor has formed at the base of her skull and is wrapping around her Carotid Artery. She is presently taking Chemo Treatments 1 day every 3 weeks, for 6 months. Her pain is improving, but she has a long journey ahead of her. Your prayers are greatly appreciated! These Pastors traveled many kilometers to welcome our family back into Namibia. We had teaching, great preaching, and good fellowship. We are excited about what God has done! God filled one with the Holy Ghost, and this man on the left was baptized in Jesus name! Sis. Maggie (above) has been faithful to this truth for many years. Sis. Ikerd was very glad to see her again. Our daughter Aubrey, fits in well with the children! Bro. Sis. Keith Ikerd & Aubrey. On May 10-12, 2013 we were privileged to be a part of UPCI Ghana’s first ever children’s camp. This took place in the Central Region with 130 children registered. There were lots of laughs, learning, and memories that took place during this time. In addition to Bible quizzing, some of the lessons taught were A Mouth-Full of Humility, A Mouth-Full of Forgiveness, and a Mouth-Full of Praise. Three children received the gift of the Holy Spirit, and many lives were touched by the power of God. We thank God for apostolic doctrine and its power to change lives. After teaching on water baptism in Jesus name and the oneness of God, the Pastor of Life in The Spirit Ministry saw these biblical truths. He was baptized in Jesus name and then baptized nine of his church leaders the next day! The founder and pastor at Power of God and Showers of Blessings International Ministry, along with his family were baptized in Jesus name. He is presently attending his first term of studies at our Bible College. Recently, the presbyter of the Ashanti/ Brong-Ahafo Region was invited to preach at Jesus Promised Church after they heard his weekly radio program. They have understood the Oneness of God message. The Pastor and ten of his members were baptized in Jesus name, and three received the gift of the Holy Ghost during their baptism. We are thanking God for the work He is doing through your partnership. Together we are expanding God’s kingdom in Ghana. Pastor Reagan has understood the importance of baptism in Jesus name. Baptizing Pastor Coffie in Jesus name! One pastor recently baptized eighteen in Jesus' name. Three Bible school students were recently baptized in Jesus' name. At the third Bible school graduation, nine students received their diplomas through the GATS program. One graduate was the first graduate from Mali and the first licensed minister there. A new church was started in a village outside the capital city. We are excited to get this new church established in sound doctrine. Nine students graduated from the certificate level of the GATS program. One GATS certificate level Bible school student pastors a church and recently baptized eight in Jesus' name. In normal weekly services there were three baptized in Jesus' name and five received the baptism of the Holy Spirit. One local church youth weekend resulted in many young people coming back to God and several new visitors coming to church. During regular services, five were baptized in Jesus' name. First Regional Children's Camp had over 100 registered campers and three received the baptism of the Holy Spirit. 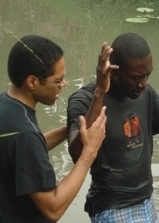 At a local church nine received the baptism of the Holy Spirit. 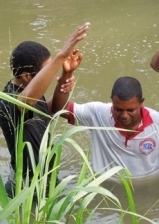 After the missionary taught sessions on the Oneness of God and baptism in Jesus' name, the pastor of a denominational church was baptized in Jesus' name and then baptized nine of his church leaders in Jesus' name. Throughout the country there were a total of 108 baptized in Jesus' name, 101 received the baptism of the Holy Spirit, and 170 reported healings. There were also 498 Bible studies taught. During two regional conferences, a total of 1,694 received the baptism of the Holy Spirit. One of the pastors baptized eight in Jesus' name and two received the baptism of the Holy Spirit. In the predominately Islamic north, ten were baptized in Jesus' name. One Muslim was reading his Koran. According to him, he understood what he was reading to mean that there was still one to come. Since the Koran referenced the Bible, he bought a Bible and began to read. When he read the Gospel of John, he was surprised to read that Jesus is the Way. He sought out one of our pastors for an explanation. He was convinced that Jesus is the one the Koran said was to come. He was baptized in Jesus' name and received the baptism of the Holy Spirit. He then enrolled in the Bible school. At the second General Conference six received the baptism of the Holy Spirit. Among the six were some who had previously been baptized in Jesus' name, and also a man who had been in church for years but had never received the baptism of the Holy Spirit. A lady was seeking since she arrived in church, in 2008. She gave the testimony that before she arrived in our church she was so sick and there were so much pressure in her life. Jesus healed her completely and the pressure become less and less present in her life until it completely ceased. There was an average attendance of twenty-two at a recent pastor's refreshers course. During revival services a total of ninety-five received the baptism of the Holy Spirit. Just after the pastor's refreshers course there were reports from local churches of six being baptized in Jesus' name and seven who received the baptism of the Holy Spirit. In a southern region, two children working on the family farm were snake bit. They were healed after prayer. The total of Pass the Word Bible studies taught during one month was 1,943. From seven regions reporting, 101 received the baptism of the Holy Spirit, twenty-six were baptized in Jesus' name, and 182 reported being healed after prayer in Jesus' name. During the last two weeks, one pastor has baptized fourteen in Jesus' name and elven received the baptism of the Holy Spirit. Two Bible school students have been baptized in Jesus' name. During four seminars several were healed and many also received the baptism of the Holy Spirit. Several pastors were baptized in Jesus' name and added to our church. A Catholic administrator came to our Apostolic doctrine seminar and heard about the healing power of Jesus. He came forward to find healing for his almost blind eyes. God not only healed him, but also he received the baptism of the Holy Spirit and was baptized in Jesus' name. In a Seminar there were two days of pastor training and two days of teachings. A total of sixteen received the baptism of the Holy Spirit and many were delivered and healed. During services in two new places, a total of ten received the baptism of the Holy Spirit and nine were baptized in Jesus' name. Two churches were also established. A few weeks ago there was a seminar conducted in one of the new places. A total of twenty-one received the baptism of the Holy Spirit and seventeen were baptized in Jesus' name including the pastor of the newly established church. Land was also purchased in the other new place and plans are being made for church construction. There has been severe flooding where several saints' houses were swept away, but thankfully there has been no loss of life. One church was destroyed due to the high water and flooding, but plans are in place to rebuild on higher ground. In one town, there were twenty baptized in Jesus' name. In another town there were twenty-one who received the baptism of the Holy Spirit. SOON! Revival reports will be coming from these nations!